A monument erected over the grave of George Anderson commemorates firemen George Anderson and James Hickey who were killed in the S.S. "City of Singapore" fire at Port Adelaide in 1924. The City of Singapore was loaded with a shipment of cars and tractors from America and a large quantity of flammable cargo, including kerosene, lubricating oil and 38,000 cases of petrol. At the Cheltenham Cemetery, on the grave of Fireman G. J. Anderson, who lost his life at the fire on the steamer City of Singapore three years ago, a handsome monument will be unveiled on Sunday afternoon. The memorial has been erected by public subscription following the efforts of a committee, of which Mr. F. Condon, M.P. is secretary, to perpetuate the memory of the firemen killed in the disaster at Port Adelaide. Consisting of a marble pedestal surmounted by a statue in marble representing a helmeted Australian fireman, lifesize, the height of the monument is 11 ft. The grave, which is 9.ft. square, will be surrounded by kerbing and covered with white tiles between the pedestal and kerb. On the base the names of the other two firemen who lost their lives in the disaster, Messrs. A. Greenman and J. Hickey, will also be inscribed. At a meeting of the memorial committee to be held tonight it will be decided who will perform the unveiling ceremony. The statue was scuptured in Italy from Carrera marble, and its erection is in the hands of Mr. John Tillett, of the Adelaide Monumental Works. News (Adelaide), 16 March 1927. The memorial erected to the firemen lost their lives in the steamer City of Singapore disaster at Port Adelaide on April 26, 1924, was unveiled at the Cheltenham cemetery on Sunday afternoon. Mr. F. Condon, who had worked hard for the memorial had been allotted the honor of unveiling it. The base, pedestal and statue are all carried out in pure white marble, the statue being made in Italy. 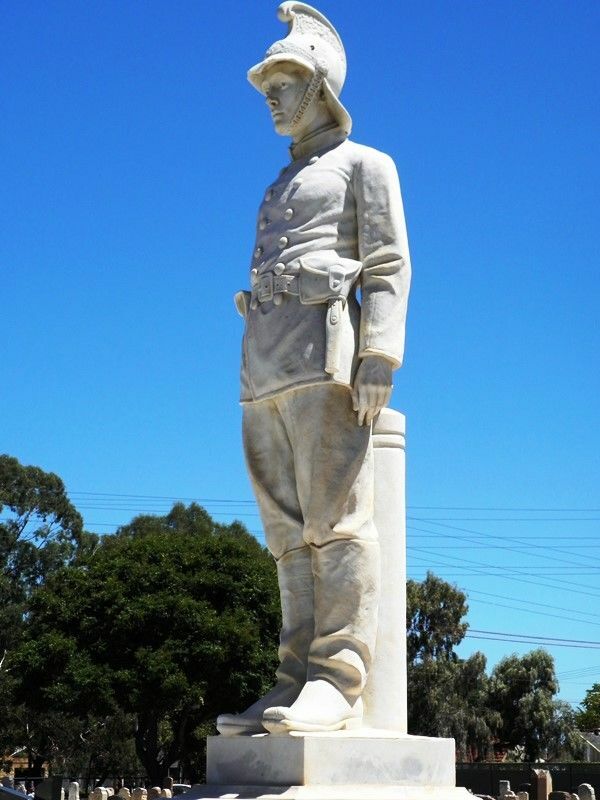 With only a photograph of Fireman Anderson to work by, the sculptor has made a remarkably convincing figure of an Adelaide fireman dressed for action. Engraved on the pedestal are the following words:— "Erected to the memory of George James Alexander Anderson and James Hickey, members of the Fire Brigade, who lost their lives in the City of Singapore fire at Port Adelaide, April 26. 1924." Members of the Fire Brigade, who lost their lives in the City of Singapore fire at Port Adelaide, April 26th 1924.